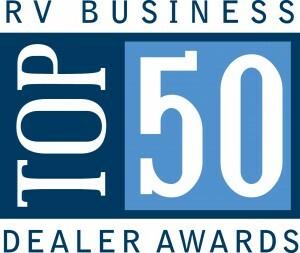 Steinbring Motorcoach has been named to the Top 50 RV Dealers in North America by RV Business Magazine in 2009, 2010, 2014, 2015, 2017 and 2018. 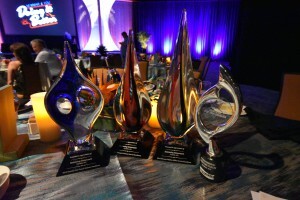 We are also recipients of the Mahlon Miller award including in 2013, 2014, 2015, 2016, 2017 and 2018. As of 2019 Steinbring’s is now a Newmar Diamond Certified Service Center so you can trust that you and your RV will be taken care of and in a timely fashion. Our service department has maintained the strict Newmar requirements and is one of only 3 dealers to be Diamond certified for 2019. We have an indoor four stall shop with pull-through access and one outside stall to take care of any work that may need to be performed on your coach with plans to expand! If your repairs require an overnight stay, we have two sites where you can camp in comfort overnight. Our factory trained technicians will ensure your RV leaves with all your issues resolved! Take advantage of the wealth of information available from Newmar by creating a Newgle account for yourself and your Newmar motorhome. Once you have an account, you’ll have access to 1,000’s of pages of helpful resources and technical data. As of 2017, we are also a factory certified Roadtrek service center. Our technicians visited the Roadtrek service school and are able to perform both warranty and customer pay work on the Hymer products. Our service department also works on all makes and models so whether you drive a Tiffin, Fleetwood, Monaco, Itasca or any other make, we will gladly repair your coach. From slide outs to generators, we have a proven track record and strong relationships with vendors and service centers to get you back on the road. Following Newmar’s motto of “Seamless Service”, we at Steinbring Motorcoach have put forth efforts to bring you “Red Carpet Seamless Service”. 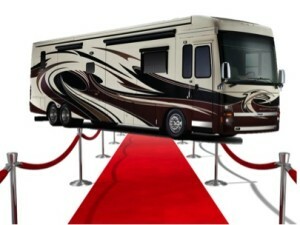 Put in place in 2013, this red carpet treatment puts you at ease as you can trust you and your motorhome will be treated with the highest level of respect and will be worked on with only factory trained and RVIA certified technicians. You will receive straight and honest answers to any concerns you have with your RV and we will go out of our way to see that the work is done right. With no finger pointing or excuses, you the customer will be taken care of. When it comes to servicing the engine and/or generator, we do not perform theses services at our Garfield location. Rather, we take your coach to AllState Peterbilt in Alexandria for all our chassis service needs. Anything from oil changes, recharging dash air to tires, the guys at AllState will take care of you. We’ll run weekly, monthly and other various seasonal specials on items such as tow bars, satellites and braking systems or services such as winterization or Oasis service. During the winter months we also offer reduced labor rates for larger jobs like roof repairs or for tile/carpet work on your RV. If you need to order parts or accessories for your motorhome, 5th wheel or travel trailer, please call our service department at 320-834-6333 and we will be glad to help you. Whether you are in need of OEM Newmar parts or aftermarket accessories or even OEM parts for makes like Fleetwood, Monaco or Tiffin, we can assist you. In previous years we offered links to online parts catalogs from various suppliers but we were not happy with the service our customers were receiving so we have discontinued those services. Most of our suppliers including Newmar allow us to drop ship parts so the transaction is still seamless and easy for you the customer. We are a professional Blue Ox installer and install tow bars and baseplates for all your towing needs. We have a local shop (Dorman Repair) that installs baseplates and takes care of all your vehicle wiring needs from tail lights to charge lines. We have been using them for years and customers are extremely satisfied with their work. Together we’ll fit your coach and car with the proper setup to allow for hassle free towing either flat towing or use of a car dolly. Use the links below to find the right baseplate for your vehicle. If you already have Demco products such as a tow bar you’ll find the link below useful. Click the link below to determine what baseplate fits your tow car. 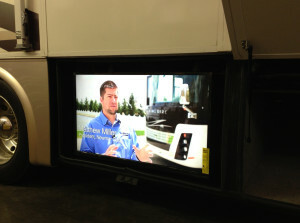 Here at Steinbring Motorcoach, we install Winegard satellites and TV antennas. 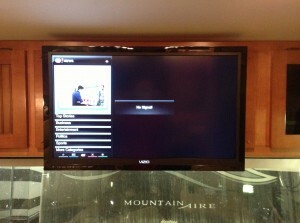 We stock various models such as the Trav’ler for Dish Network and Direct TV and the Mission for your in-motion needs. While we install the components in your coach, we use a local business called Blue Collar Bob to obtaining receivers and hooking up new accounts. Located in Alexandria, he is just a phone call away! Wether its a new install or you have a Wingard on your older coach, you can find all the manuals and setup guides you need with the link below! Whether you want to replace your old televisions or add a new one, we can easily upgrade your motorhome with the latest and greatest flat screen TV. From front overhead TVs, to large mid-ship TVs or even TVs in the basement of your coach, we can securely mount a new TV in your RV today! You can either provide us the TV or better yet, we will match the largest possible television with the space you have and hook up all your existing or new components as well. With dozens of TV installs under our belt, we have perfected a custom mount system that will ensure your TV will stay securely in place and be squeak and rattle free. So whether you want to add a TV in the bedroom or front overhead compartments or you want a big screen in your basement, call and schedule an appointment today. Feel free to call for estimates as well! Sure your motorhome is great for traveling across the country but when you like to explore downtown areas, it is sure nice to have a tow vehicle! We get a lot of questions about towing vehicles behind RVs so we help this guide helps. Download the RV Towing Guide 2019 towing guide and be sure to call our service department with any tow bar or brake system questions! Nobody likes having the exact same things as other people. This is were accessories come in! Search our online parts catalog for that perfect RV accessory or campsite addition. Whether you are looking for awning lights, wheel covers, chairs or rugs, we have it all. We even stock items like games, cups and mugs and apparel. If you are unable to find what you are looking for online, call or email us as we can order from various other suppliers and ship the parts right to you. Take a look at the latest in RV flooring with Infinity woven vinyl here and update your motorhome interior! Odds are you will be driving your motorhome when the sun is out or have it set up at at campsite with the sun beating down on it. Keep those harmful rays out of your coach and keep your carpets, furniture and interior components looking like new. Tinting your RV’s windows also helps keep it much cooler during summer months. We can arrange tinting services are our location in Garfield or basically anywhere in central Minnesota thanks to Kevin at Shaded Image. If you have any questions about how tint can benefit you and your motorhome, give him a call at 612-281-6113. 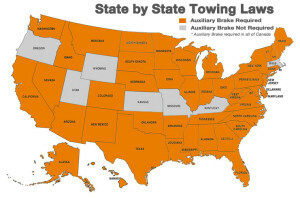 While there is some gray areas in the rules for having a braking system in your tow vehicle, this picture provided by RVi Brake (our recommended system) shows you that most states it’s the law to have one! Keep your passengers, RV and tow car safe with the proper towing equipment.